There’s no telling how strict national regulations on greenhouse gas emissions will be in the future, but it might be less costly for the electricity industry—and the environment—if they invested in carbon-free electricity now, says MIT’s Jennifer Morris. When utility executives make decisions about building new power plants, a lot rides on their choices. Depending on their size and type, new generating facilities cost hundreds of millions or even billions of dollars. They typically will run for 40 or more years – 10 US presidential terms. Much can change during that time. Today one of the biggest dilemmas that regulators and electricity industry planners face is predicting how strict future limits on greenhouse gas emissions will be. Future policies will affect the profitability of today’s investments. For example, if the United States adopts a carbon tax 10 years from now, it could make power plants that burn fossil fuels less profitable, or even insolvent. These investment choices also affect consumers. In South Carolina, utilities were allowed to charge their customers higher rates to cover construction costs for two new nuclear reactors, which have now been abandoned because of construction delays and weak electricity demand. Looking forward, if utilities are reliant on coal plants instead of solar and wind, it will be much harder and more expensive for them to meet future emissions targets. They will pass the costs of complying with these targets on to customers in the form of higher electricity prices. With so much uncertainty about future policy, how much should we be investing in noncarbon electricity generation in the next decade? In a recent study, we proposed optimal near-term electricity investment strategies to hedge against risks and manage inherent uncertainties about the future. We found that for a broad range of assumptions, 20 to 30 per cent of new generation in the coming decade should be from noncarbon sources such as wind and solar energy. For most US electricity providers, this strategy would mean increasing their investments in noncarbon power sources, regardless of the current administration’s position on climate change. 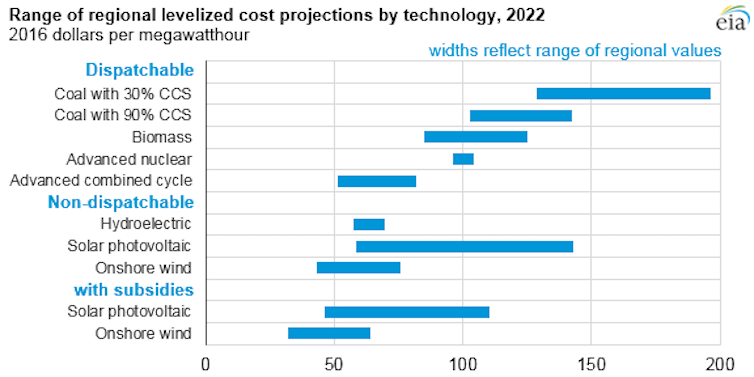 Many noncarbon electricity sources – including wind, solar, nuclear and coal or natural gas with carbon capture and storage – are more expensive than conventional coal and natural gas plants. Even wind power, which is often mentioned as competitive, is actually more costly when accounting for costs such as backup generation and energy storage to ensure that power is available when wind output is low. Over the past decade, federal tax incentives and state policies designed to promote clean electricity sources spurred many utilities to invest in noncarbon sources. Now the Trump administration is shifting federal policy back toward promoting fossil fuels. But it can still make economic sense for power companies to invest in more expensive noncarbon technologies if we consider the potential impact of future policies. How much should companies invest to hedge against the possibility of future greenhouse gas limits? On one hand, if they invest too much in noncarbon generation and the federal government adopts only weak climate policies throughout the investment period, utilities will overspend on expensive energy sources. On the other hand, if they invest too little in noncarbon generation and future administrations adopt stringent emissions targets, utilities will have to replace high-carbon energy sources with cleaner substitutes, which could be extremely costly. We conducted a quantitative analysis to determine how to balance these two concerns and find an optimal investment strategy given uncertainty about future emissions limits. This is a core choice that power companies have to make when they decide what kinds of plants to build. First we developed a computational model that represents the sectors of the US economy, including electric power. Then we embedded it within a computer program that evaluates decisions in the electric power sector under policy uncertainty. The model explores different electric power investment decisions under a wide range of future emissions limits with different probabilities of being implemented. For each decision/policy combination, it computes and compares economy-wide costs over two investment periods extending from 2015 to 2030. We looked at costs across the economy because emissions policies impose costs on consumers and producers as well as power companies. For example, they may lead to higher electricity, fuel or product prices. By seeking to minimise economy-wide costs, our model identifies the investment decision that produces the greatest overall benefits to society. We found that for a broad range of assumptions, the optimal investment strategy for the coming decade is for 20 to 30 per cent of new generation to be from noncarbon sources. Our model identified this as the best level because it best positions the United States to meet a wide range of possible future policies at a low cost to the economy. From 2005-2015, we calculated that about 19 per cent of the new generation that came online was from noncarbon sources. Our findings indicate that power companies should put a larger share of their money into noncarbon investments in the coming decade. While increasing noncarbon investments from a 19 per cent share to a 20 to 30 per cent share of new generation may seem like a modest change, it actually requires a considerable increase in noncarbon investment dollars. This is especially true since power companies will need to replace dozens of aging coal-fired power plants that are expected to be retired. In general, society will bear greater costs if power companies underinvest in noncarbon technologies than if they overinvest. If utilities build too much noncarbon generation but end up not needing it to meet emissions limits, they can and will still use it fully. Sunshine and wind are free, so generators can produce electricity from these sources with low operating costs. In contrast, if the United States adopts strict emissions limits within a decade or two, they could prevent carbon-intensive generation built today from being used. Those plants would become “stranded assets” – investments that are obsolete far earlier than expected, and are a drain on the economy. Society will bear greater costs if power companies underinvest in noncarbon technologies than if they overinvest. Investing early in noncarbon technologies has another benefit: It helps develop the capacity and infrastructure needed to quickly expand noncarbon generation. 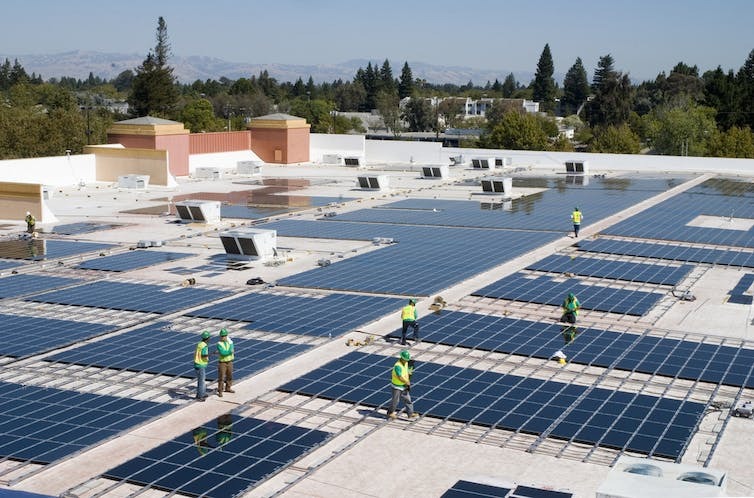 This would allow energy companies to comply with future emissions policies at lower costs. The Trump administration is working to roll back Obama-era climate policies such as the Clean Power Plan, and to implement policies that favour fossil generation. But these initiatives should alter the optimal strategy that we have proposed for power companies only if corporate leaders expect Trump’s policies to persist over the 40 years or more that these new generating plants can be expected to run. Energy executives would need to be extremely confident that the United States will adopt only weak climate policies, or none at all, into future decades in order to see cutting investments in noncarbon generation as an optimal near-term strategy. Instead, they may well expect that the United States will eventually rejoin worldwide efforts to slow the pace of climate change and adopt strict emissions limits. In that case, they should allocate their investments so that at least 20 to 30 per cent of new generation over the next decade comes from noncarbon sources. Sustaining and increasing noncarbon investments in the coming decade is not just good for the environment – it’s also a smart business strategy that is good for the economy. Jennifer Morris is Research Scientist, Joint Program on the Science and Policy of Global Change at the Massachusetts Institute of Technology. This article was originally published on The Conversation.